Feeling the restrictions from our former home, we have jumped ship in order to make our online residence more comfortable. There shall be easier access to all downloads, there will be a clearer interface to enhance historical records, and there shall be a greater level of correspondence and interaction. The aim is simple; clarity. First up is the announcement of the new collaborative cassette by three parties distanced by geographical locations. The members of Kodiak Gold, Petals and Slump reside in the disparate locations of Cheshire and Huddersfield and London, and so decided to use the age old if not terribly weary postal system to overcome this issue. A cassette arrived in Huddersfield when I returned from my festive jaunt through the Midlands and to West Sussex. This was then processed and added to before being posted along, with the original cassette, off to London to face additional processing and new input. 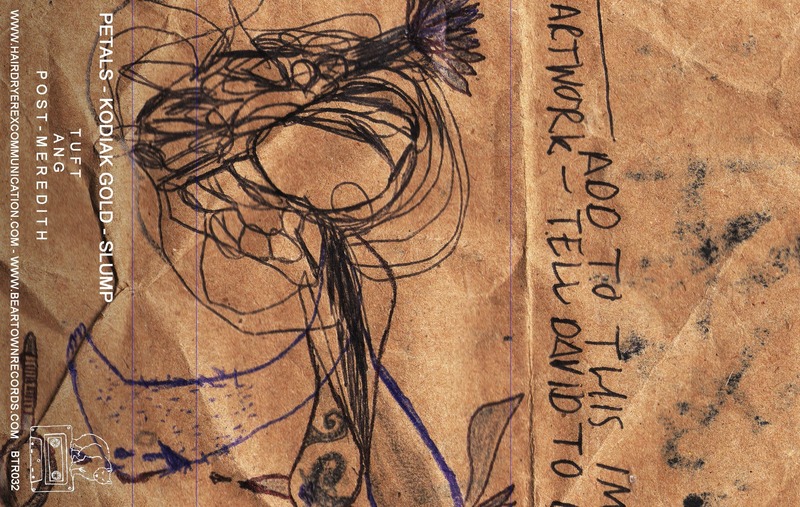 The art work was formed at the same time, with a scrawl becoming the threeway scrawls that adorn this new tape. Expect bass tinkering, tape scramble and analog electronic fury. Head over to Beartown Records to grab your copy of Tuft ang Post-Meredith.